Cefn Coch cottage offers cosy, quaint and clean accommodation. 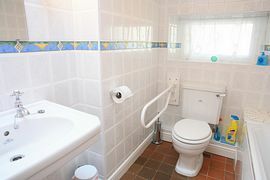 The ground floor has a recently refurbished bathroom designed to be sympathetic to the less able. A modern fitted kitchen with dishwasher, microwave, fridge and freezer. Dining area for six people, with patio doors leading onto the enclosed, private front garden and terrace with seating for 6, ideal for those who enjoy dining alfresco. 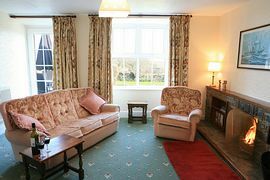 The lounge has: comfortable seating, TV, DVD and open fire. A utility room with washing machine, dryer, iron and ironing board. 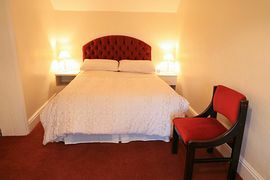 There is a cosy bedroom with twin beds. Upstairs there are 2 bedrooms (double, twin) a second bathroom with over bath electric shower and wonderful views of open countryside and the spectacular rocky coastline. Oil fired central heating offers comfort in all seasons. Outdoors an interesting building with character stone built walls, grassed areas, gardens and ample private parking. 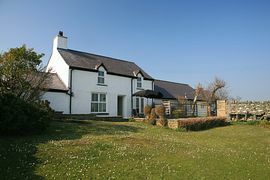 Cefn Coch Cottage is surrounded by open farm land which is let to those who keep horses, sheep and cattle and country codes should be observed by all guests. Continue to end, turn right up hill, Cefn Coch is situated on the right after large white house on left and just 4 tenths of a mile from the junction and beach. Low Season: £375.00 per week. Mid Season: £495.00 per week. High Season: £560.00 per week. Peak Season: £775.00 per week. Short Stay Breaks are priced at 70% of the weekly tariff - minimum 3 nights stay - please note these are not available during high and peak season until one week prior to the holiday start date. September 2006 - Carolyn, Alex, Lawrie, Cissy and Jess Birkhead, Oxfordshire. "Beautiful! Kind, helpful people, fantastic countryside. I want to live here!! Thank you! Happy, sandy children!!" June 2006 - Moores family, Cheshire. "Just what we needed, weather and cottage excellent, we will be back." July 2007 - Nicola Steve Olivia and Isobel Moores. "Had a fantastic week, we were here last year and we will hopefully be back next year." August 2006 - Henshaw family. 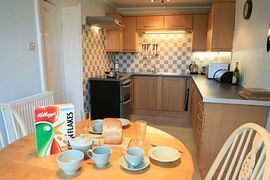 "A great cottage, very child friendly, fab location, hope to be back soon." May 2007 - Richard and Diane Hall, Shropshire. "Lovely cottage, lovely weather. Stayed extra few days - reluctant to go back. Thank you so much." June 2007 - Rob, Judith, Andrew Caroline and Ellie - Derbyshire. "Clean, cosy and comfortable cottage, friendly welcome, ideal location, excellent base. Porth Dafarch beach is second to none." July 2007 - Mason Family. "Have had such a happy week with my family. The cottage is a delight, comfortable, well equipped. With the perfect beach close at hand Porth Dafarch has everything." August 2007 - Jo, Colby, Nick and Ellie Burke. "Back again for another lovely holiday! Weather great too this time. Thanks again." July 2007 - Sara, Lee, Amy and William Gray. "Again another lovely holiday. Cottage is perfect for all of us and really enjoyed our stay here, see you next year." Feb, 2007 - Carroll Family. "Lovely homely cottage, Thank you for the hospitality, enjoyed ourselves immensely." "Lovely cottage in a wonderful tranquil location." "We have had a fab time, welcome pack was wonderful thank you." "The cottage is very comfortable and beautifully clean, many thanks for that." August 17 2007 Joe, Tom, Debbie, Jeff, Sue and Don. "As a retreat from the rain and a base when the sun shines Cefn Coch would be hard to beat."